Among many integration possibilities, such as the new GraphQL API, WorkflowGen also features incoming and outgoing webhooks functionalities. Webhooks are a modern integration solution that allow an API to exchange information with other applications through HTTP POST requests. Since they allow instant real-time communication, webhooks are efficient and very easy to deploy. For example, they can be used for notifications when an expected event has occurred, or to build integrations with extendable applications such as Slack, GitHub and Dropbox. Outgoing webhooks are a simple way to post notifications from an API to an external resource, such as to post a message to a Slack channel. WorkflowGen uses the SENDHTTPPOST workflow application to send outgoing webhooks to external applications using JSON or URLENCODED payloads. The SENDHTTPPOST application then receives and processes the responses from the external API. Incoming webhooks allow users to perform operations in WorkflowGen from external sources, such as to create or cancel requests; complete, cancel or assign actions; add or remove comments; create, update or delete favorites; and cancel request actions by name. 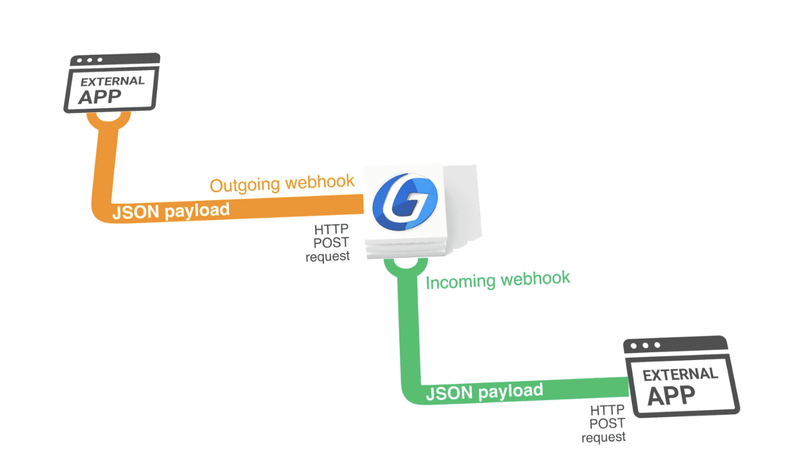 In WorkflowGen, the incoming webhook application receives HTTP POST request payloads formatted as JSON objects, and interprets them as configured in the API. Sample API templates that use the SENDHTTPPOST workflow application to send outgoing webhooks are available on GitHub. The Incoming webhooks section in the WorkflowGen Integration Guide contains sample request and response JSON payloads to perform operations in WorkflowGen. The SENDHTTPPOST workflow application section in the WorkflowGen Administration Guide provides detailed information on how to use the SENDHTTPPOST workflow application to send outgoing webhooks, including tables of required and optional parameters.